As black adds sophistication and elegance to any space, it can be used in a variety of ways to fit in with the theme, style, and size of your dining room. When it comes to dining room design, black is often overlooked as a color option, mainly because people usually believe that this color simply doesn’t work well in dining rooms. However, adding black does not necessarily mean creating a dark, gloomy setting. When tastefully used, black adds touches of drama and sophistication. Plus, it helps create truly unique spaces with charm and personality. Take a look at some gorgeous dining rooms and find inspiration how to use black to definitely breathtaking dining spaces. The use of black creates bold, dramatic, classy spaces. If paint seems too boring for a black background, opt for wallpaper to also add texture to the space and break the visual monotony. Go beyond a plain old white ceiling! If you want to keep your walls light, then paint that ceiling black to create a spectacular space. Trying this approach in spacious dining rooms that have a high ceiling is a gorgeous option to add an extra dose of sophistication and interest. However, keep the room well lit and organized to avoid unnecessary visual clutter. Designers use dark floors to bring visual contrast to a room in an understated fashion. Black floors are far less intimidating than all-black walls. By using decor elements in a similar hue, you create a coherent look that makes a dramatic impact when the walls are painted plain white. Repeat the color throughout the room using other accessories to get the best possible result. Rugs and drapes are an inexpensive and easy way to add black. A wall of dark curtains and a matching rug do create a huge visual impact! By using drapes, rugs, and decor elements in black and a pristine white backdrop you can easily create the classic black and white look. Choose from an array of gorgeous pendant lights on offer to introduce black. 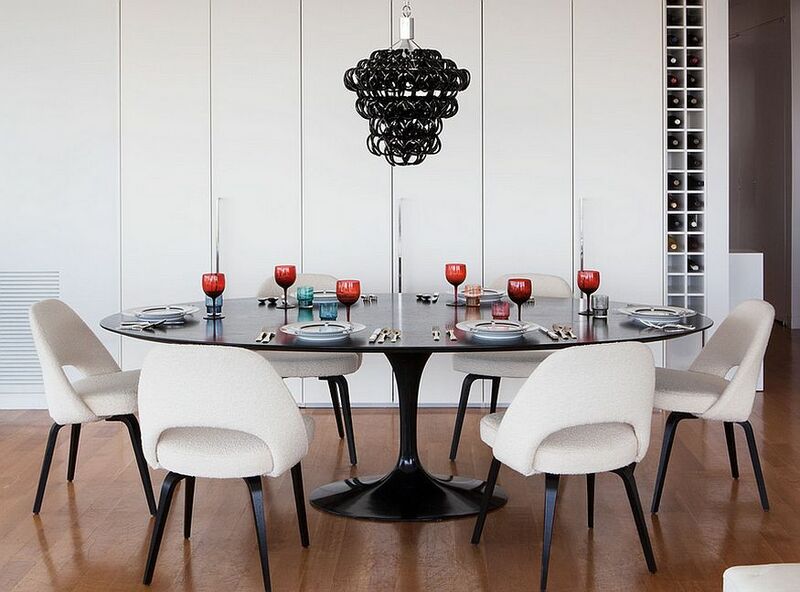 Also, large drum pendants in black are perfect for adding drama and creating a sensational focal point.